I was so inspired by the overwhelming response to my Random Acts of Kindness Christmas Calendar for Kids, that I’ve decided to make it easy to spread kindness all year long. 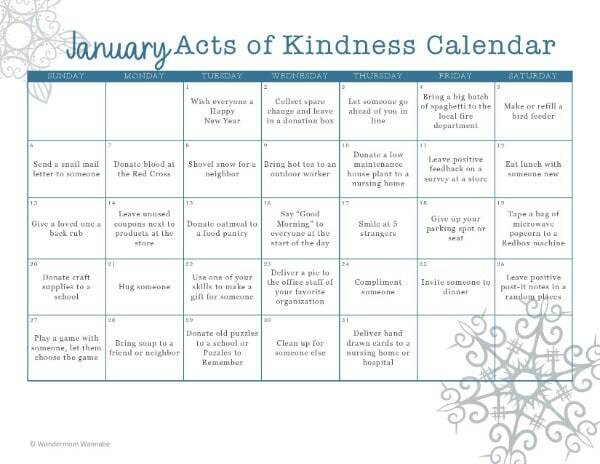 So, I’m going to create a new calendar each month, starting with this January Acts of Kindness Calendar. Don’t worry. January isn’t going to be a rehash of December’s calendar. Instead, each month I’m going to include acts of kindness related to that month’s theme. For example, January is National Blood Donor Month so one of the acts will be to give blood. January is also National Soup Month so you’ll find a suggestion to bring hot soup to someone who is under the weather. I’m also going to have some fun with unique holidays. Did you know that January 21 is National Hugging Day? What better day to spread a little joy and kindness by giving someone a hug? Not every act will tie in with a specific theme so you will find some familiar suggestions. Remember, everything on the calendar is just a suggestion. The very fact that you are reading this post indicates that you are a kindhearted person. Instead of viewing the calendar as a daily to-do list, let it serve as a gentle reminder to spread joy to others. 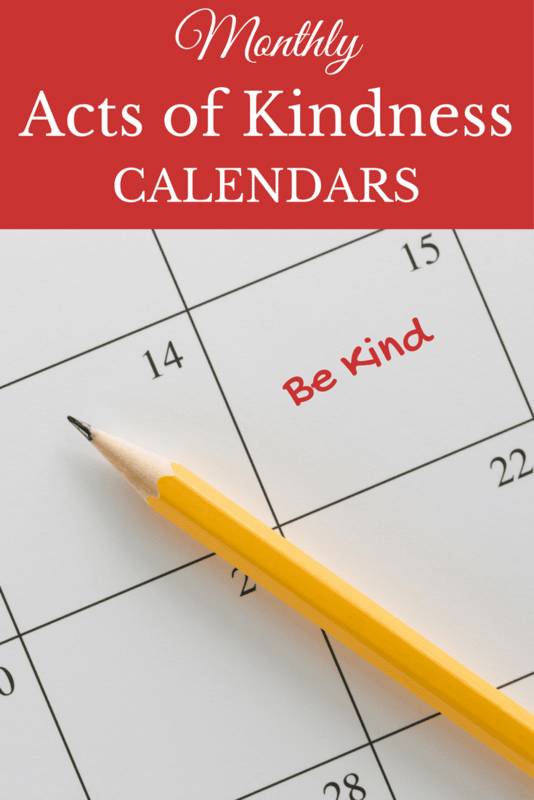 Check out my other monthly kindness calendars. Remember to visit each month to grab the new one. I love this idea! And how you included Christmas with blank calendar to fill in as well as cut and paste squares to draw at random:)! We are looking forward to trying it out this year! Does your 2019 bundle have the blank versions for each month as well? (dated calendar with no acts, and acts with no dates?) thanks! The bundle does NOT have the blank versions…yet. I don’t know why that didn’t occur to me before! Adding it to my to-do list for this week. That’s a great idea. Thank you! Thank you Paula! I try to publish them a month in advance so February’s is already up if you want to grab it early. 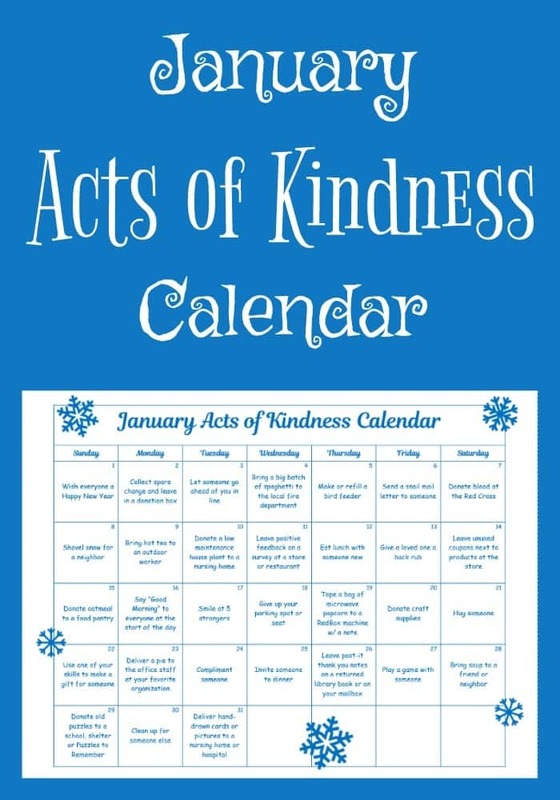 You can find it here – https://wondermomwannabe.com/february-acts-of-kindness-calendar/. Have a wonderful week! I love your Random Acts of Kindness calendars! It is such a great idea to get children involved in philanthropy at an early age. Thanks for this amazing list! !